Happy Thursday and welcome to Ladies Night at The Slow Roasted Italian! We are celebrating this Ladies Night with a seasonal specialty cocktail. Pomegranate lends incredible flavor and color to any cocktail. It has long been known for its exquisite beauty, flavor and heath benefits. 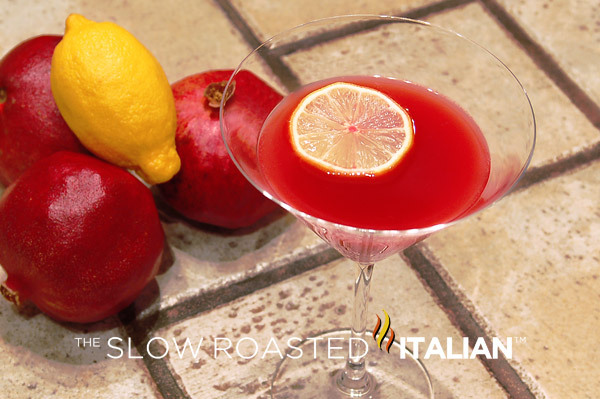 In this martini the pomegranate is the star, a little sweet, a little tart, a little healthy and A LOT FABULOUS!!! Combine ingredients in a cocktail shaker 1/4 filled with chopped ice. Shake and strain into a cocktail glass. Serve with a squeeze of lemon. I'm not a huge martini drinker (more of a beer and wine gal), but this does look delicious! Great minds think alike - I was playing around last night trying to make a Holiday Cocktail - ended up with a pom martini with gin! Can't wait to try yours tonight! Ladies night rules. You always have the best cocktails! This looks wonderful. I love a simple drink like this because it has so much flavor!